The Chandra image shows Mira A (right), a highly evolved red giant star, and Mira B (left), a white dwarf. To the right of the image is an artist's conception of the Mira star system. Mira A is losing gas rapidly from its upper atmosphere via a stellar wind. Mira B exerts a gravitational tug that creates a gaseous bridge between the two stars. 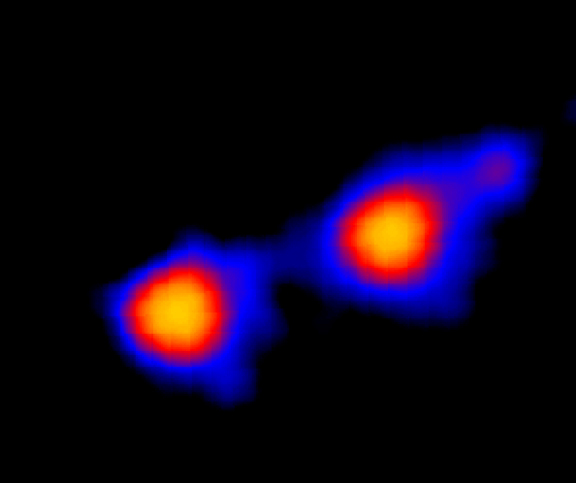 Gas from the wind and bridge accumulates in an accretion disk around Mira B and collisions between rapidly moving particles in the disk produce X-rays. The separation of the X-rays from the giant star and the white dwarf was made possible by the superb angular resolution of Chandra, and the relative proximity of the star system, at about 420 light years from Earth. The stars in Mira AB are about twice as far apart as Pluto is from the Sun. The ability to distinguish between the interacting stars allowed a team of scientists to observe an X-ray outburst from Mira A. An ultraviolet image made by the Hubble Space Telescope was key to identifying the X-ray outburst with the red giant star. Mira A (or simply, Mira) was named "The Wonderful" star in the seventeenth century because its brightness was observed to wax and wane over a period of about 330 days. In this advanced red giant phase of Mira A's life, its diameter has swollen to about 600 times that of the Sun and it is pulsating, due to increasingly energetic nuclear reactions in its core. Mira A is now approaching the stage where its nuclear fuel supply will be exhausted, and it will collapse to become a white dwarf. In contrast, Mira B has already reached the white dwarf stage, and is about the size of the Earth, but about a quarter million times more massive. Before this observation it was assumed that all the X-rays came from a hot disk surrounding Mira B, so the detection of an X-ray flare from the red giant star came as a surprise. This outburst was likely an indirect consequence of the internal turmoil in Mira A.
X-ray studies of the Mira star system may also provide better understanding of interactions between other binary star systems consisting of a "normal" star and a collapsed star such as a white dwarf, black hole or a neutron star. Scale Image is 1.2 arcsec per side. Coordinates (J2000) RA 02h 19m 20.70s | Dec -02° 58´ 39.51"